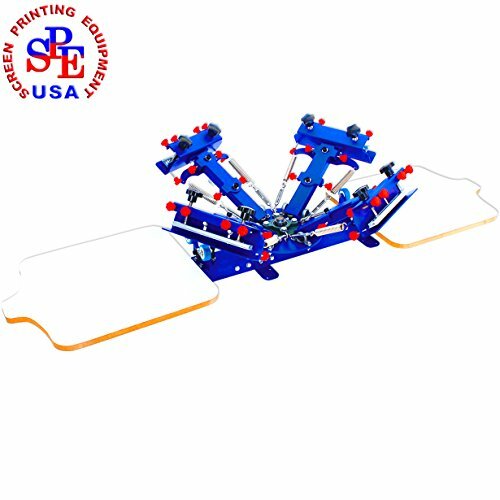 The screen frame support arm is equipped with fourhandles on both sides adjust the screen printing. Adjustment the two screws before the screws fixed after trimming fix up two screws. All the machines adopt advanced electrostatic spraying .the parts adopt stainless steel aluminium ,nickel platingand galvanized process,it is corrosion resistant and no rust. All the packing adopt the export standard five layer corrugated paper ,there are hard and soft foam and three-ply board in the box. All the metal parts are separated by the soft foam. Each machine is equipped with the complete set of installation tools. This machine is four color screen printing machine,suitable for two operators. The operator just need to stand in one station to work,the platen and frame can rotate in 360 degree,the operator don't need to move. Mainly used for T-shirt printing,also printed cloth and other products. All the Machines Adopt Advanced Electrostatic Spraying .the Parts Adopt Stainless Steel Aluminium ,Nickel Plating and Galvanized Process,It is Corrosion Resistant andNno Rust.